General Motors, whose Chevrolet Volt electric hybrid is now beginning to roll into Chevy dealerships across America, is also in involved in innovating some very interesting transportation concepts. Two of these concepts involve using hydrogen powered fuel cells to provide electricity for one or more electric motors to propel the cars along at speeds ranging up to 130 mph and with cruising ranges of up to 300 miles (480 km). 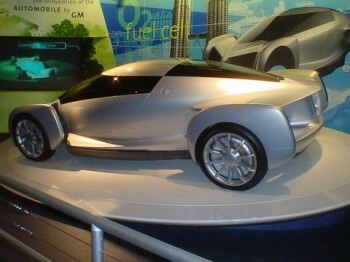 The Sequel car concept, called the “next-generation hydrogen car” was unveiled at the Detroit auto show already back in 2005. From the outside, it looks very much like an ordinary SUV 4X4, except for the electric engine and power source, which consists of a sophisticated fuel-cell stack that has a rated power output of 73 kW (98 hp); and is supplemented by a lithium-ion battery pack rated at 65 kW. Using a specially designed flat “skateboard chassis” and a special “drive by wire” steering system, the Sequel stores 8 kg of hydrogen gas in three cylindrical, carbon-composite fuel tanks, pressurized to 10,000 lbs p.s.i. and mounted longitudinally beneath the cabin floor. 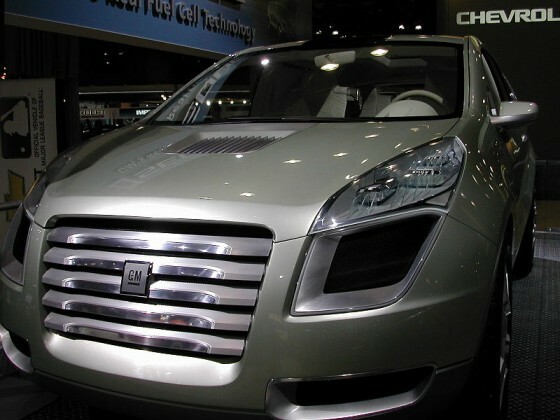 The Sequel is another version of GM’s still experimental “Hy-wire” hydrogen car concept, which was originally introduced in early 2002 and enables a driver to navigate the car either in a left or right hand drive mode, and without the need to use brake or acceleration pedals – these functions are done electronically by controls built into the steering device that is no longer a wheel but something resembling that used in a commercial airliner. The Hy-wire car is a complete drive-by-wire system composed of cameras instead of mirrors and multiple LCD displays for feedback to the driver. This theoretically allows the driver’s seat to be located anywhere in the car’s cabin; although the most favored driver position is still a forward one. Due to the fuel cells being powered by compressed hydrogen gas, both of these car concepts are virtually non-polluting, with the only exhaust emission being water. In other Green Prophet articles, the use of electricity and hydrogen as power sources has been mentioned; including one in which hydrogen and even water (which is composed of two molecules of hydrogen and one of oxygen) as fuel sources, providing a way can be found to separate these volatile gases. It may still be a while before hydrogen will be used as a fuel sources for cars driven in the Middle East , due to fossil fuels including natural gas still readily available and easier to handle. Since hydrogen is one of the most common elements on this planet, it only stand to reason that this important gas and water’s main component could one day become a very reliable, and green fuel source. With So Much Oil and Natural Gas Is Biofuel a Viable Middle East Option?